434, Lot: 240. Closing Dec 12, 2018 at 11:20:00 AM ET. SELEUCIS and PIERIA, Antioch. Hadrian. AD 117-138. Æ (25mm, 13.48 g, 12h). 434, Lot: 241. Closing Dec 12, 2018 at 11:20:20 AM ET. SELEUCIS and PIERIA, Antioch. 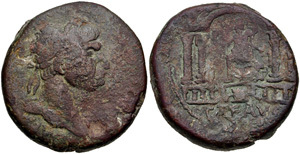 Macrinus, with Diadumenian as Caesar. AD 217-218. Æ As (20.5mm, 4.39 g, 5h). 434, Lot: 249. Closing Dec 12, 2018 at 11:23:00 AM ET. DECAPOLIS, Dium. Julia Domna. Augusta, AD 193-217. Æ (20mm, 5.97 g, 12h). Dated CY 268 (AD 205/6). 434, Lot: 251. Closing Dec 12, 2018 at 11:23:40 AM ET. DECAPOLIS, Dium. Caracalla. AD 198-217. Æ (24.5mm, 11.78 g, 12h). Dated CY 271 (AD 208/9). 434, Lot: 252. Closing Dec 12, 2018 at 11:24:00 AM ET. DECAPOLIS, Dium. Elagabalus. AD 218-222. Æ (20mm, 6.67 g, 6h). 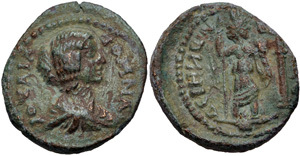 Dated CY 283 (AD 220/1). 434, Lot: 266. Closing Dec 12, 2018 at 11:28:40 AM ET. JUDAEA, Caesarea Maritima. Trajan. AD 98-117. Æ (28.6mm, 24.82 g, 1h). 434, Lot: 270. Closing Dec 12, 2018 at 11:30:00 AM ET. JUDAEA, Gaba. Hadrian. AD 117-138. Æ (24.5mm, 11.38 g, 12h). Dated CY 177 (AD 116/7).